I’ll never forget the first time someone taught me how to read God’s Word. Not just read it and move on, but read it and really hear God speak to me. It transformed how I read God’s Word. Not all in one day, of course, but over time. I thought I’d share that process with you today. for God is our refuge (NLT). PRAY and invite God into your time with Him … to open the eyes of your heart to receive what He wants to teach YOU as you open His living and active Word. READ the passage. Read it through a few times. LIST the facts … not details, not your thoughts … just the facts. Who is speaking? What is the subject? Where does the scene take place? When did it happen? Who are the characters? What is the author saying? Try not to paraphrase. Use actual words from the passage itself. The subject is the character of God. God is our rock. Our salvation. Victory and honor come from God. God is our refuge. Our rock. Pour out our hearts to God. ***This is an example. Your list may not look like mine, and that’s okay. ASK what the verse/passage means. Go back to your facts and look for the spiritual lesson or principle the author conveys through the facts. There may be more than one. It’s more of a general lesson, not necessarily a personal application for you (that comes next). Is there a command to obey? A promise to claim? A warning to heed? An example to follow or not to follow? What do the facts reveal about God’s people? About God’s character? About the culture? About Jesus or the Holy Spirit? We need to be still before God and listen and wait. We find hope in God’s many magnificent names. Rock. Salvation. Fortress. Refuge. Because of God’s character, we will not be shaken. He is our safe place and protects us from the enemy. Victory is found in God and God alone. God wants us to pray and trust Him with our circumstances … fears, trials, doubts, worries. ***Again, this is my example. You may find other spiritual lessons. I’d love to hear yours in the comments. ASK what the verse/passage mean to you personally. Return to step three, take your statements and turn them into questions. What you hear may be for you or for a friend or family member. Sit with your questions and invite God to speak into your heart what HE has for you? Do I take time to be still before God? If not, why not? Where do I turn when I’m weary, overwhelmed, fearful? Do I let my circumstances shake me to the core, or do I turn to and trust in God? Where do I place my hope? Do I know the names of God and what they mean? Do I entrust God with my heart and my fears, trials and concerns? If not, to whom do I go and does that work for me? RESPOND to what you hear from God. You may not always have a response. Sometimes God is deepening your walk with Him by teaching you more about His character, His people, His history. There may not be a personal action step. But, oftentimes, God will have a personal response for you. He will invite you to take an action step. To put into practice what you have learned. If you don’t hear anything, but you sense God is at work, write a prayer. Below is a combination of ways you can incorporate this passage into a prayer. And, if you hear God speaking directly into your circumstances, record the verse, date it and journal what you hear. Ask God to give you the courage to take the steps He is asking you to take or to have the faith to believe what He has told you. Sweet friend, I pray this has been helpful. GIVEAWAY – now closed – congrats Katria! 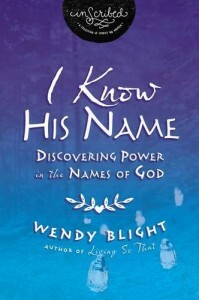 Since we studied several of God’s names today, I thought it would be fun to give away a copy of “I Know His Name,” my Bible study book that studies the names of God. Please leave a comment and share your thoughts on what you learned today. We’ll choose one winner from the comments (U.S. addresses only please). And, if you have other ways to study God’s Word, please share. We would love to hear your thoughts! If you are reading this in email, click here to comment on the blog. P.S. Last week’s winner of the Enough bracelet from Sharon Jaynes is Joyce S.
I have your book but Have not started to read it…I have learned so much from you looking forward to more. Thank you for your kind words! I pray that when you open it, the Lord will reveal wonderful new truths and promises that will transform your heart and mind. Thank you for fixing my problem with making comments…its a blessing to communicate with you again. Kim is a superstar!! She can fix anything. I will let her know you left a message of thanksgiving. So thankful you can comment now. Just last week a mother and daughter in our Dinner Church called Common Ground asked a friend and me to do a Bible study with them. We’ve been asking the Lord where to start. So I was thrilled to find your message in my inbox! Thanks so much for this timely direction. Oh, Barbara, I LOVE God’s timing. I pray that as you and your group open the pages of I Am Loved and meet God in His many magnificent names, you will come to know Him deeper and richer and more intimately. Thank you for letting me know! Oh, Nancy, thank you. And I LOVE studying God’s Word with you!! I have been sharing with a friend about reading and studying Gods Word! This is perfect timing! Don’t you love when God does that???? So thankful to be a vessel for Him to speak into what you and your friend are doing. You are one of God’s finest creations! I have been blessed by your Bible Studies in more ways than I could ever have imagined. My husband is a Pastor and he started participating in the PS31 online Bible studies with me. There are many wonderful teachers; however, you became one of our favorites. Thank you Lord for gifted Bible study leaders. Please continue to equip Wendy because she has many more woman (and men) to bless. Julie, what a precious gift to read your words today. It’s so fun to connect with my Bible study friends. Thank you, thank you!!! And, thank you for your prayer for me. I truly treasure you and your prayers. You know this is similar to a recipe…I always use a new recipe exactly as it has been given to me when I make it the first time. Then, as with all things, you personalize it as you go and maybe change it here and there to make it just the way it is best for you! Studying God’s Word is our daily bread, but sometimes gets a little stale if we try to do the same type of reading and study every single day. The nutrients we need are there, we just are doing it sometimes because we know we need to. Bringing a fresh perspective and approaching God’s Word in a new and different way can open our minds and hearts to a fresh Word from Him! Always, just what we need for the moment! Hope, what a wonderful analogy. Thank you. And, I agree!! It’s like the Lord’s Prayer. It’s a great recipe. A guideline. Something we can take and make our own. Loved this book. Would love to win one to give to a friend. Thank you, Sheila. Love your heart to want to share it. God is so good to meet you right where you are. So thankful to be the one He chose to use to bless you and speak into your heart to encourage you. Peggy, praying for God to direct your every step as you seek direction on this change. Love how you laid this out so well! Great steps to put into practice. Two more things I like to do are read the passage in context and in different versions. (Biblegateway.com makes that pretty simple.) Today what spoke to my heart as I worked through Psalm 62 is waiting. Verse 5 begins with this as does verse 1…it’s repeated for a reason. As I think about waiting, the Holy Spirit brings to mind other truth I’ve studied about waiting and I’m reminded not to waste it or be anxious in it. Thanks for this short, yet vital lesson Wendy! Thank you for adding a few suggestions. LOVE the suggestion to read in different translations! Thank you for this outline. So often after I complete my daily reading, I know I didn’t really comprehend, or let it sink in. My pastor recently touched on this as he reminded the congregation that one of our responsibilities is to remember what we hear, and as we go back to our daily routines, recall the sermon and apply it to our lives. I know reading my Bible and applying these tips will help me to remember and apply God’s daily word more effectively. Thank you, Wendy! Love what your pastor said and this should align well with that. You can do it with sermon teachings as well since they are usually filled with Scripture. So thankful this spoke directly into what he was teaching you. God is faithful to speak to us from many different avenues when He wants us to really get something that’s on His heart for us. This is what I needed to hear this morning. I’ve been anxious and dishonored. Knowing that it is through God that I gain victory and honor helps me to look to Him instead of to something or someone else for these things. I’m planning on thinking on this Psalm more this morning. Oh, Amanda, your words touch my heart. You know your thoughts are leading you away from truth and peace and God has met you in that place. What a tender heart you have. I’m blessed to be a small part of how He is ministering to you here. I pray what we are learning helps you as you walk this journey to gain victory IN CHRIST and find your worth and value in Him alone. What a practical approach to studying God’s Word. Thank you for sharing. I look forward to putting your steps to work. Writing the Word and reading different versions has been so helpful for me this year. Yes! Both are so good. Writing what we read and using other translations helps bring the Word more alive in our hearts. I have always struggled with Bible study, speed reading through and gleaning nothing. Therefore to really enjoy it, I haven’t. I have your book, and am trying to read and absorb it. Please pray that I will love Gods Word and desire it more. I realize I need it now more than ever, even after being in ministry for almost 50 years. And Wendy, I miss you on First5! Sue, I’m asking God to bring His Word alive in fresh ways as you commit to open it with a hungry and thirsty heart. May it be like a spring of living water washing over your heart and mind. May it quench your heart like never before and give you desire for more and more!! Thank you for your kind words. It means so much to know you miss me. There are times I miss it, but I love what I am doing as the biblical content coordinator for our P31 Online Bible Studies. Thank you for the encouragement and beauty you bring into our lives. I would love to have your book. Thank you for sharing how to really study God’s word. I read but sometimes don’t understand this helps to learn how and how to journal in a more positive way. This would help me to take the time I need to take in God’s word. Thank you for sharing. God bless you. Thank you for this. I am anxious to apply it to my study time. Yay! I’m so thankful you want to try this. I pray God speaks to you in a sweet and intimate way as you try something new with your Bible study time. Oh, I love that the prayer was for you!!! That means so much to me. Thank you for this wonderful map to study God’s Word. Too often I just read and read. Never taking the time to actually study the words. I am printing this out for future reference. Thank you Wendy. As always in my life, God uses your words to help me. I love that you are printing this out. I know God will be faithful to speak a fresh Word into your heart as you seek to hear from Him. And, thank you for your kind words. They mean so much as I continue to teach and write. I loved your message today. I read the Bible and my daily readings, but I often struggle with how to use them in my life. I try so hard to hear what god is saying. Your message today was one I needed to hear. It gives me clarity and direction on how to hear and study his word. Thank you for your insight and for the love you have for God as it shows in your writing. You are so welcome. It blesses me to know that the love I have for God’s Word comes through in my writing. It wasn’t always that way for me. I had a teacher who deeply loved God’s Word, and her passion was contagious and caused me to fall in love with His Word in the same way. Thank you for taking the time to share your heart and kind words. I pray your time in God’s Word is more fruitful as you study using these tools. I’m been one for reading and moving on. Step three is a new concept as I’ve never thought of writing down the facts and then using them as questions. Each step builds on the other. Thanks for sharing with us. At first when I wrote the facts, it annoyed me. I thought it was a wasted step. But the more I did it, the more I realized how much I would skip facts, especially when I was familiar with a passage. I learn so much more when I read more thoroughly and carefully. So thankful this spoke to you as well. Oh Wendy. God has really given you a wonderful gift that you have graciously shared with so many. You are my favorite. I am going to work hard at changing my ways to study lime this. I changed some when doing your I Am Loved study, but have not gone into this depth. This verse is exactly what I was trying to tell my friend yesterday. She has lost all hope. She’s a mess. When I mentioned that she needs to read God’s word her response was, “what? Some book a bunch of old men wrote.” Well, on my soap box I jumped. But it got me thinking about when my son said that to me. So many believe that. Is there a book or video that explains to people that the bible is true? So many need this foundation. Thank you! Your teachings have changed my life!! Peggy, thank you, thank you for your sweet words of blessings and encouragement. They mean so much. I’m sorry for your friend. What a hard place to be … a messy life and no God to turn to and not hope. I’m thankful she has you. I pray the Lord will use you to love and minister to her in the way she needs that will see Jesus in you and make her want more of what you have. There are some great men of God who have written books, but the book, now movie “A Case for Christ,” is one of the best ways I know. The author was an atheist who basically came to Christ by proving that it was the only way that made sense. I think your son might like the movie. It’s well made and got good reviews. It may be on Netflix. Came out in the last year or two. Thank you Wendy! I printed this out so I can take it home and really digest it in my quiet time. Having your steps easily accessible will help me to learn as I go through other verses. So thankful it spoke to you!! Our ladies group is currently studying this book. God is blessing us with new truths about His character. Thank you Wendy for listening to the Lord as you wrote this book. These truths will strengthen us in the power of God’s night. Oh, I love that you are going through “I Know His Name.” Thank you for choosing to study it!! I know there are many other studies out there. Means so much you chose this one. Knowing and praying the names of God has been life-changing for me. 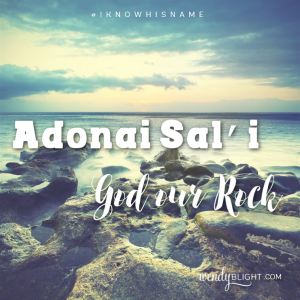 I love learning more about the names of God, as they give me such a marvelous perspective of the overall grasp of who He is and who I am in Him and in Jesus. Since my earthly father didn’t give me a true representation of what a father should be, it is a blessing to know my Heavenly Father and how he loves and cares for me. Yes, me too. Studying the names of God deepened my faith and my prayer life as I learned their meaning and how to pray more specifically using His names. Thank you Wendy for sharing this. I also study God’s word by picking a verse, I read it silently, out loud and in a different version. Then I write it out, write what the key subject is, key verse, key people, key words, key principles, application – what I will do about what I learned and then a conclusion- what has God shown me and a response to the knowledge I’ve gained. Marian, these are GREAT suggestions!!! Thank you for taking the time to share. So helpful to have various ways to do this. Thanks for your devotional this morning. I need to use this in my daily quiet time. I don’t have a certain method for studying God’s word so this is very helpful. So thankful this peaked your interest. I pray God will speak to you in a fresh way as you study His Word through a new method. He will be faithful! Thank youuuuuuu Wendy for these terrific learning tools! Also, thanks for the chance to win another of your books! Blessings be yours…. I think step Five is where I need to work most! I do stop and think to myself how I can apply what I’ve read, but if I make it a point to stop and actually write down/journal questions of how I can apply it, I might actually take better action with what I’ve studied. It seems to get me to study and think more in depth. Just what I needed today as I turn my questions over for answers. God is good!! Yay! Yes, He is. Good. All. The. Time. I really enjoyed reading about the 6 Steps to Studying God’s Word. Thank you for sharing. It would be wonderful to win the book. I love to have important things outlined in ways that make them easier and more instructive. Thanks you for sharing this, Wendy! I’m printing these steps out and placing them in my Bible. Janice, your words make me smile. So sweet to think of these steps being tucked away in your Bible to use as the Lord leads. I know He will be faithful to take you deeper still with Him. I read your article and found these verses in Psalms 62:5-8 to become a great inspiration to me. I know that God is my only hope and the Rock of my life. I can hide in the fortress of His love and not be shakened by the lies of the enemy. God will deliver me and bring His protection and peace into my heart. He will lead me into a victory over Satan to give me a deeper trust in Him. I worship Him as the all sufficient One who meets my every need. May Christ continue to guide me as I study His Word to make His life strong within my spirit. Thank you for these words and method to make study of the Word become practical and applicable. Kathy, thank you, thank you for applying this right here and now. I LOVE what you did. So fun to see it come alive in your heart. Thank you for sharing such an understandable method. The break-down into steps, with detailed explanations and examples will be a wonderful tool as I pursue more in-depth study of God’s word. You’re such a blessing to so many! Yay! So thankful what God has taught me connected with your heart. Thank you for your kind words!! I love what I do. These easy to follow steps are such a help to me as I endeavor to study God’s word. The book on the names of God would be a great help as well! I’m thankful they seem doable to you. I know God will be faithful to deepen your walk with Him as you dig deeper into His Word. I have enjoyed your biblesudies so much. Thanks for the steps. Everyday I learn more about who God is. Isn’t it amazing. Your words, “everyday I learn more about who God is.” What a precious gift to have a God that continually reveals more and more of Himself to us. I’m thankful to know that what He has taught me in the Bible studies I’ve written has spoken to your heart as well. My daughter’s name is ADONIAH; God is my Lord. I say it all day every day. I named her that so that every time I, or anyone else says it, it is being proclaimed, “God IS her Lord”. Yet, I have forgotten that as I say it, I can also be proclaiming; “God IS MY LORD” as well! He IS, of course. I love God. I have just been through a terrible few years, my whole immediate family has as I suddenly came down with a rare incurable spinal cord disease and epilepsy. When all of my medical problems started 5 years ago I was determined to walk through it and have my children watching their mom as the greatest example of a faith-filled Christian woman! When I started failing at holding up that image I got harder on myself and lost sight of God being My Lord, My Rock, My Refuge, My Fortress. I slowly stopped reading The Word and started hating myself for it because I use to be a serious student of it and bible teacher for years. I was so devoted and now wake up everyday angry at myself for allowing chronic pain and my physical and emotional condition to take me down a path that I know I do not belong on. It’s interesting to me to have received this email today. I haven’t gotten a Wendy Blight email for such a long time. I opened it because of the “AdoniaSal’i”…I think God knew this one would get my attention! This ol’ bible study teacher needed to be reminded how to study the Word again, fresh and new. Without guilt and condemnation for not doing it for so long, but because It is GOOD. Because GOD IS GOOD. Because there is LIFE in it. Because I can find Love & Instruction in It. I can take Refuge in My Lord, in My Rock and in His Word. Thank you so much for your ministry. Hopefully, prayerfully, someday God will return me to ministry someday too. Oh, Katria, tears fall from my eyes as I read your words. YES, YES!! God is drawing you back. No shame. Just your Abba Father longing to have your teacher’s heart back in His Word, hungering and thirsting, learning and sharing. I pray for a fresh filling of His healing power and healing Word. Friend, even if you don’t feel well enough to get out, you can minister through writing. Through a blog, an Instragram account, Facebook. We love volunteers at online Bible study. Then you can do it on your own time … on the days you feel stronger. I’m praising God He drew you here today to draw you back to HIM!!! He is waiting for you to soak up all He has for you. He wants to fill you to overflowing. Thank you, Thank you, Thank You!! I so needed this! I do bible study and read the bible. Ttruth be told it is from the head. These steps will assist me in getting it into the heart!! Hallelujah!! Love God met you here. And, YES! These steps help move what we read from our head to heart and bring it alive in our bodies!! Excellent way to study the Bible! Let God speak. The Bible is alive and speaks a unique word to each one who reads it. Amazing. Blessings on your day! Thank you for stopping by!! Yes, God does speak to each one of us individually what He has for US to learn about Him, His people and ourselves. Blessings back to you! Thank you for sharing these steps to Bible study. I find it helpful to change Bible study methods from time to time–to keep things fresh. This is a great list of steps which I’ve been doing for some time now. I’m trying to learn the names of God, but they keep wandering from my brain. . . . some are sticking. Thank you for the encouragement to study God’s Word. I love what Jeremiah 15:16 says, “Thy were found, and I did eat them; and thy word was unto me the joy and rejoicing of mine heart: for I am called by thy name, O LORD God of hosts.” It’s my heart. Jeremiah 15:16 is one of my favorites!! Thank you so much for not just giving the address but quoting it. Such a powerful verse. Thankful they spoke to you. Awww. Thank you for leaving a sweet message about First 5. I do miss being with First 5, but I love my new assignment with P31 as biblical content coordinator for our P31 Online Bible Studies. It’s fun to be doing a new thing. But I miss our wonderful F5 community. I do love the new writers we have. I felt like this particular post was speaking directly to me since I have been trying to figure out how to find out how to begin my own Bible Study. I have been searching for workbooks, etc. and a mutual friend sent me here. Wow! This makes me smile. God knew the desire of your heart and drew you here. I’m honored to be a small part of how He is equipping you for this call He has placed on your life. I’m thankful your friend sent you here. May He continue to fill you with everything you need to start this study. He will be faithful!! What a great way to study the Word! I will definitely be referring to these principles again and again. I love learning about the names of God. I would love your book “I Know His Name”! Thank you for always blessing us! You are so welcome. Thankful God met you here. Wonderful way to read and study the Word of God. I learned about the powerful names of God that sometimes we forgot about them. God is my Rock, my Fortress, my Salvation, my Refuge, my Hope, my Strength, my everything. Hallelujah! I want to be still before Him and listen His sweet voice. Amen. These are some of my favorite names of God. What they stand for and speak to … WHO He is in our lives is powerful. Thank you for sharing! What precious gifts … a new grand baby and a daughter-in-law who is hungering for all things Jesus! I pray the same for my son’s wife, whenever God brings her. I’m thankful the Lord met you here today. These steps are so practical and incredibly helpful. I just used the model you provided and it helped to keep me on track. Thank you for these tools! I struggle with the focus & concentration needed to study the Bible. I have always wanted to study the Names of God. Wow Wendy, this is awesome. God’s timing is ALWAYS perfect. I have been praying about and trying hard to read God’s Word and understand it more. Our church just held its revival and it amazed me how the guest speaker could take each passage and break it down detail by detail. I am currently studying the minor prophets with Proverbs 31 and have been reading each passage and working through what was really being said and what God wanted me to get from the reading each day before completing the experience guide and reading the First 5 app lesson. Prior to that, I completed your I am loved study and did the same thing. Little by little I am learning, but what you provided in this lesson will help me tremendously. I can’t wait to print it and put it in my Bible to use daily! Thank you SO much. Thank you for this insight, this is very much like doing an exegesis. My beautiful friend… thank you for this post. What life-giving, practical steps. I remember when I had a heart to study the Bible but without any wisdom like this, it felt so overwhelming. I am going to share this with anyone in that tender place. A few years back, I started to index my revelations. Very similar to what you said about journaling. I keep it in a Word document (a new document for each year). The topics are alphabetized. And then I note the date God showed me something on that topic. That way I know where to find it in my journal. The other day, I was in need of a new start. So I went through my index and found all of the God-given revelations that I had already learned and re-read all those journal entries. It’s amazing how many life-changing revelations God gives me that I forget! I love you my dear friend! Thank you for sharing your study method. It’s simple to follow but promises deeper understanding of God’s Word. Lord… help me to put on your armor and trust you!